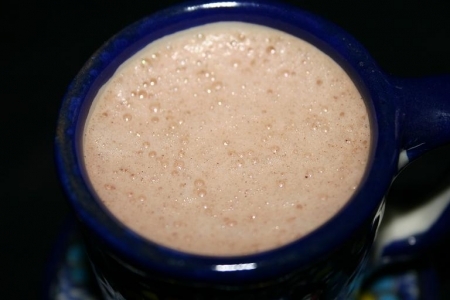 Mexican chocolate is rich and a little goes a long way and is best served in espresso cups. The recipe that follows will fill 4 espresso sized cups. Abuelita Mexican chocolate by Nestle is easily found in most grocery stores, but use your favorite brand. Warm milk and tabilla over low heat in a small pot. Stirring often. Once the chocolate has melted transfer to a Batidor and use the Molinillo to create an exceptional frothiness. If you do not have a Batidor or Molinillo, simply pour heated milk and chocolate into a blender and blend until smooth and frothy. Pour hot chocolate directly into your espresso cups and serve.